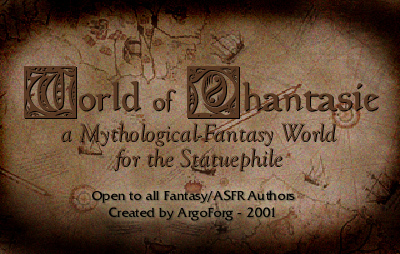 Note: Argo Forg’s World of Phantasie was originally conceived as a shared world to which any interested authors could contribute. The original site fell dormant and was deleted when the Many-Realms domain went down. I have restored the entire site, with Argo’s permission and a few code tweaks, and the invitation for other authors to join in remains open. I previously said: “Although the original site has now been restored, I’ll keep this mirror active just in case.” Well, now the original site is gone, so I guess it’s lucky I did. Enter now, into a world of ancient times, when the wonder of magick was everywhere and men of strange power walked the Earth. Journey to a far-off land, where beauty and danger lurk around every bend in the winding road or a flowing brook. Heed ye, of the perils that accompany foolishness and the rewards that come to those that choose... wisely. In every story there is a beginning, and this saga begins with a simple wizard and a complicated spell. The tale continues as the true powers of the gift come to be discovered.